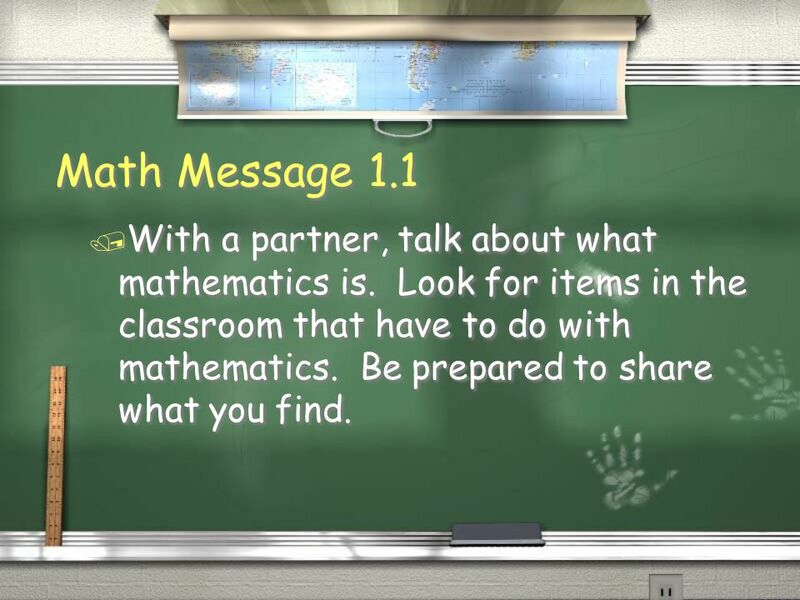 2 Math Message 1.1 With a partner, talk about what mathematics is. Look for items in the classroom that have to do with mathematics. Be prepared to share what you find. 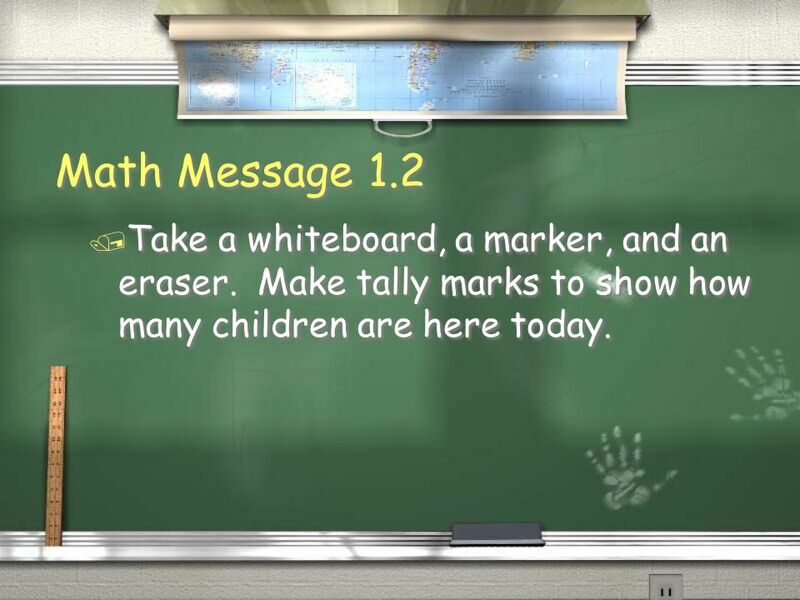 3 Math Message 1.2 Take a whiteboard, a marker, and an eraser. Make tally marks to show how many children are here today. 4 Math Message 1.3 How many months are in a year? Can you name the months? 5 Math Message 1.4 Write the date and time on the top of journal page 5. Do problems 1-7 on page 5. 6 Math Message 1.5 Cut out the play money from Math Masters pages Count the money. How much do you have? Take an envelope. Write your tool-kit number on the front of it. Put the money inside. 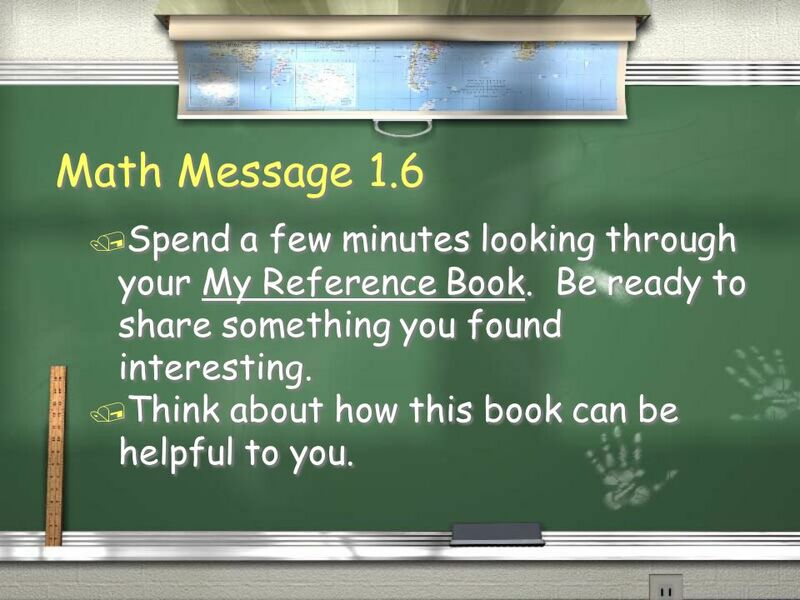 7 Math Message 1.6 Spend a few minutes looking through your My Reference Book. Be ready to share something you found interesting. Think about how this book can be helpful to you. 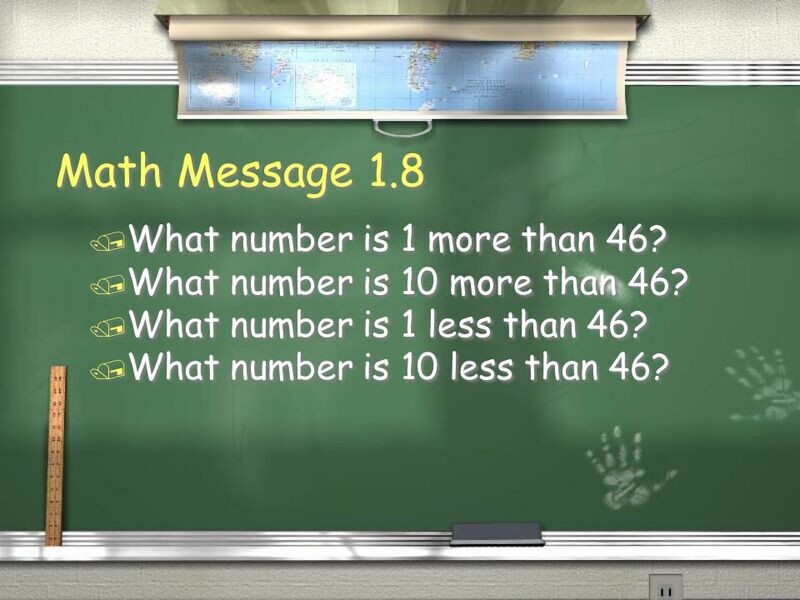 9 Math Message 1.8 What number is 1 more than 46? What number is 1 less than 46? What number is 10 less than 46? 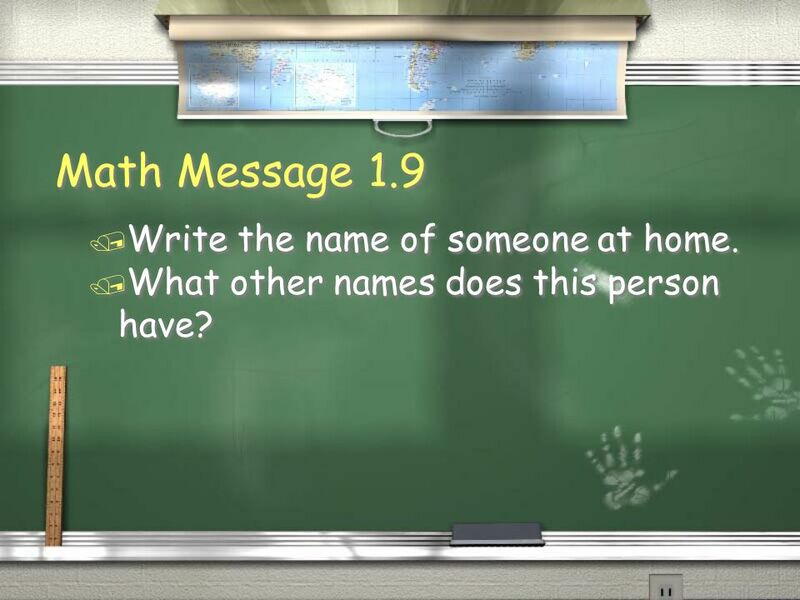 10 Math Message 1.9 Write the name of someone at home. What other names does this person have? 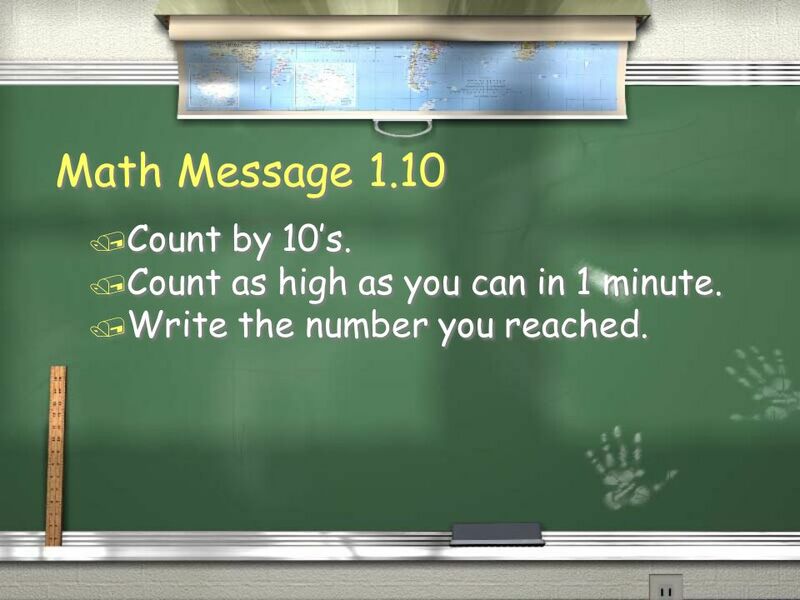 11 Math Message 1.10 Count by 10’s. Count as high as you can in 1 minute. Write the number you reached. 13 Math Message 1.12 Make a list of words to describe the weather. 14 Math Message 1.13 Complete the Self Assessment. 15 Math Message 2.1 5 children are skating. 8 children are playing ball. 16 Math Message 2.2 Make up two problems; one addition and one subtraction. Tell what calculator keys to use to solve them. Write any other “doubles” facts that you know. 19 Math Message 2.5 Write all the doubles addition facts. 20 Math Message 2.6 Make up a story for the number model = 7. 21 Math Message 2.7 Take out your envelope of Fact Triangles. 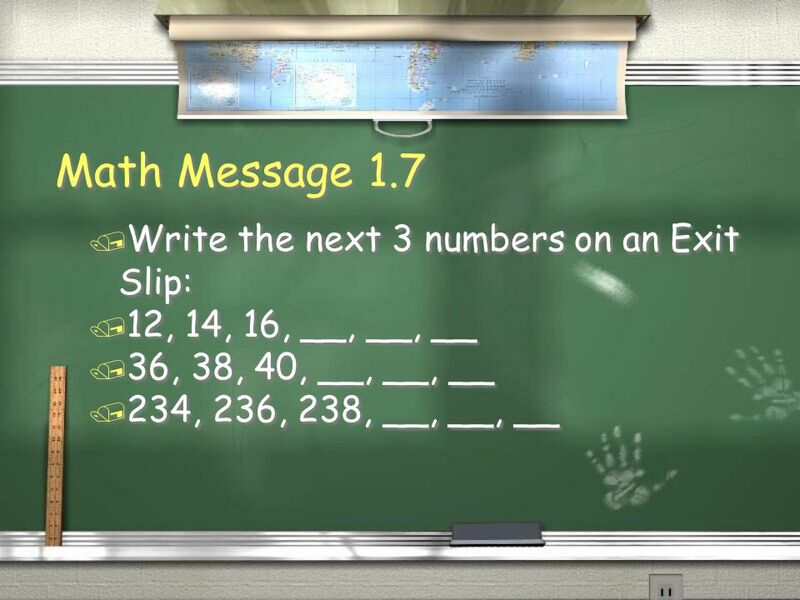 Write your name, and write “Fact Triangles” on the envelope. 22 Math Message 2.8 Which is heavier - 1 ounce or 1 pound? Do you think your calculator weighs more than one pound or less than one pound? 23 Math Message 2.9 Write as many different names for the number 8 as you can. 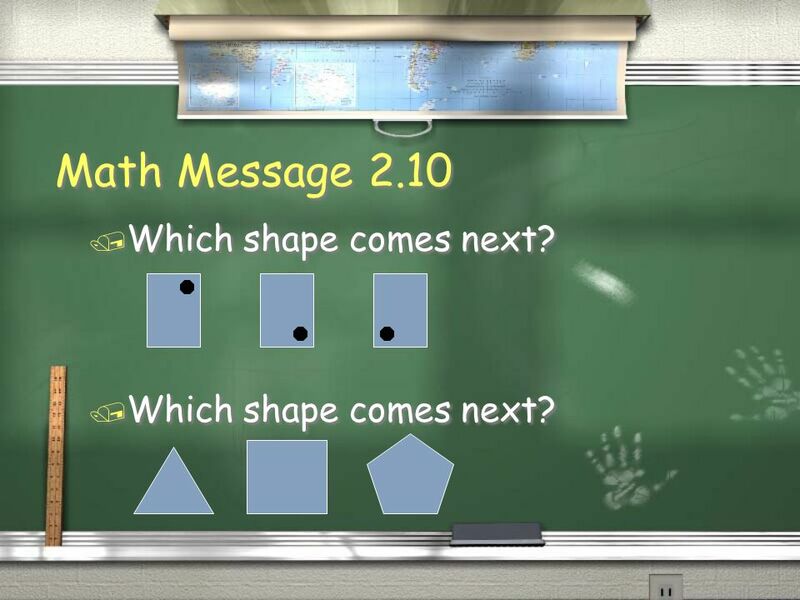 24 Math Message 2.10 Which shape comes next? 25 Math Message 2.11 Judy is 3 years older than Kevin. If Kevin is 7 years old, how old is Judy? 26 Math Message 2.12 Make up a story for the number model = 3. 27 Math Message 2.13 On an Exit Slip, make up a story for the number model = 7. 28 Math Message 2.14 Complete the Self Assessment. 30 Math Message 3.2 Take 10 pennies, 6 nickels, 4 quarters, and 2 $1 bills from your tool-kit. How much money is that? 31 Math Message 3.3 Find the clock with your tool-kit number on it. Set the hands to show the time when school starts. 32 Math Message 3.4 The picture below shows one way to draw 36. On your whiteboard, draw at least 2 other ways to show 36. 33 Math Message 3.5 Take one of the small pieces of paper labeled Counting Pockets. Follow the directions. 34 Math Message 3.6 Here is a Frames-and-Arrows problem that uses nickels. Take a blank Frames-and-Arrows diagram and make up a problem that uses nickels, dimes, or quarters. 35 Math Message 3.7 You buy a toy that costs 48¢. Which coins would you use to pay for it? Draw the coins on your whiteboard. 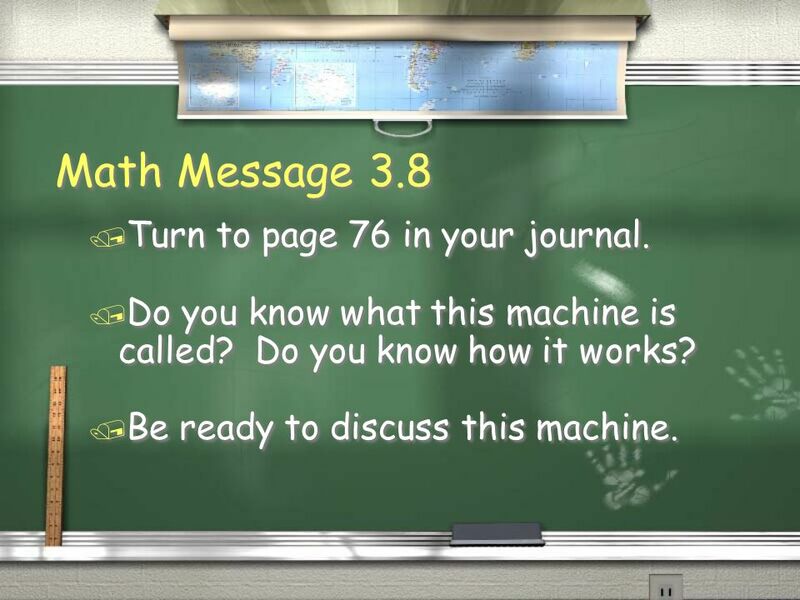 36 Math Message 3.8 Turn to page 76 in your journal. Do you know what this machine is called? Do you know how it works? Be ready to discuss this machine. 37 Math Message 3.9 Complete the Self Assessment. 38 Math Message 4.1 Which weighs more - a dry paper towel or a wet paper towel? Why? 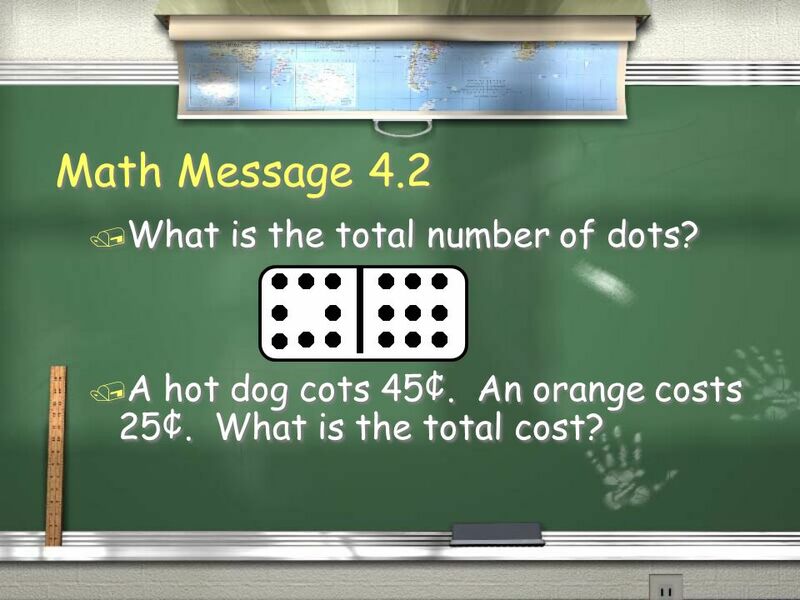 39 Math Message 4.2 What is the total number of dots? A hot dog cots 45¢. An orange costs 25¢. What is the total cost? 40 Math Message 4.3 Why are there two sets of marks and numbers on our Class Thermometer Poster? 41 Math Message 4.4 At what temperature does water freeze (turn to ice)? You have $ Do you have enough money to pay for both items? 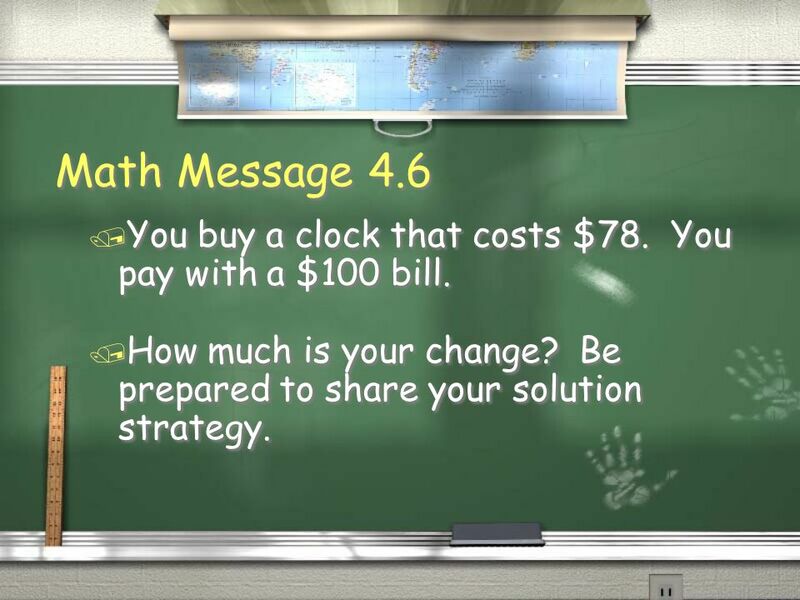 43 Math Message 4.6 You buy a clock that costs $78. You pay with a $100 bill. How much is your change? Be prepared to share your solution strategy. 44 Math Message 4.7 Name two things you would measure with a ruler. Name two things you would measure with a tape measure. 47 Math Message 4.10 Complete the Self Assessment. 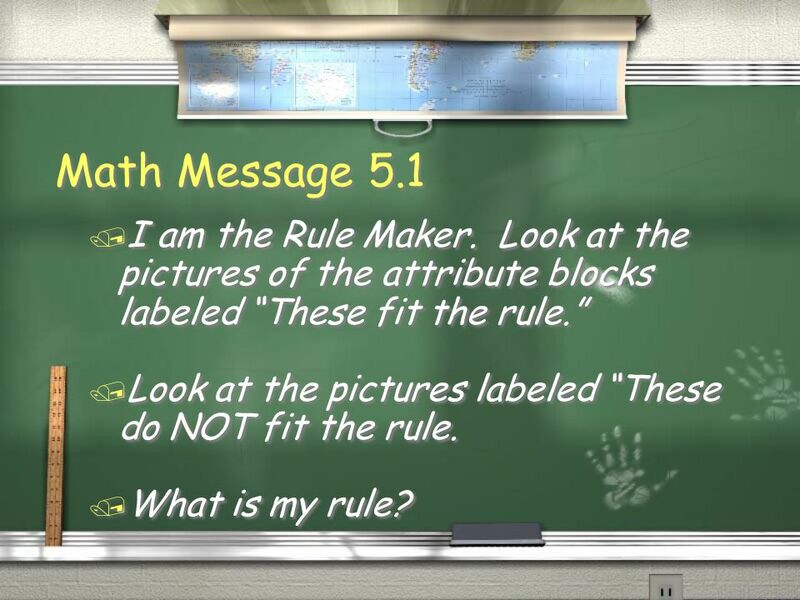 48 Math Message 5.1 I am the Rule Maker. Look at the pictures of the attribute blocks labeled “These fit the rule.” Look at the pictures labeled “These do NOT fit the rule. What is my rule? 49 Math Message 5.2 Write a sentence that has the word point or points in it. 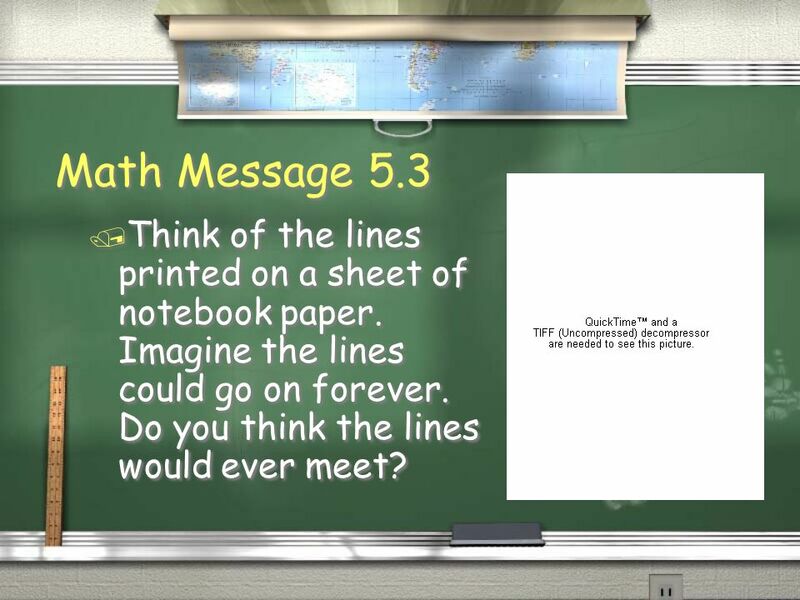 50 Math Message 5.3 Think of the lines printed on a sheet of notebook paper. Imagine the lines could go on forever. Do you think the lines would ever meet? 51 Math Message 5.4 Write the names of ALL the Pattern-Block Template shapes on an Exit Slip. 52 Math Message 5.5 Trace each quadrangle that you find on your Pattern-Block Template. 53 Math Message 5.6 Find two things in the room that have only flat sides. Find two things that have round sides. 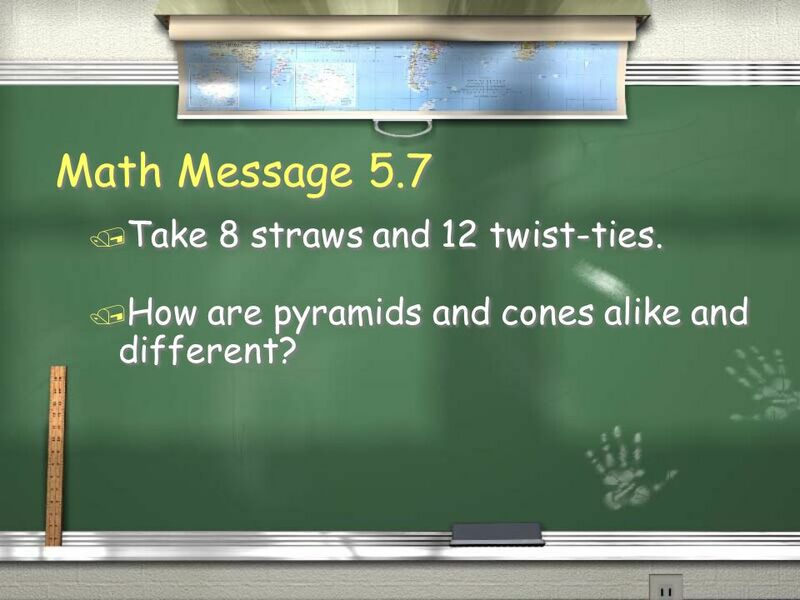 54 Math Message 5.7 Take 8 straws and 12 twist-ties. How are pyramids and cones alike and different? 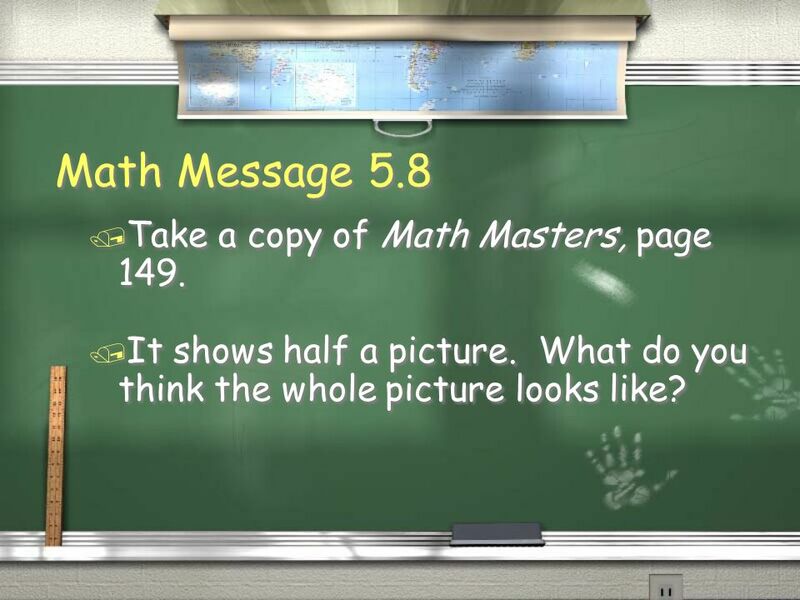 55 Math Message 5.8 Take a copy of Math Masters, page 149. It shows half a picture. What do you think the whole picture looks like? 56 Math Message 5.9 Complete the Self Assessment. 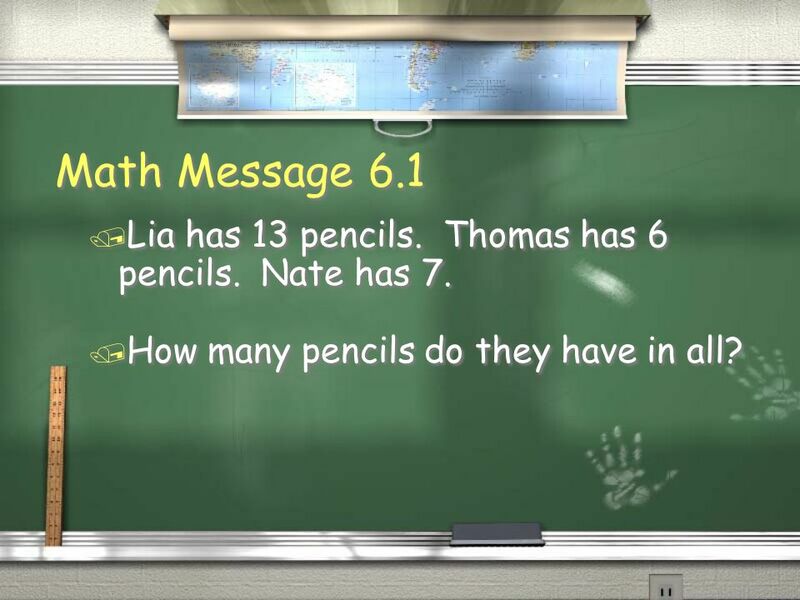 57 Math Message 6.1 Lia has 13 pencils. Thomas has 6 pencils. Nate has 7. How many pencils do they have in all? 58 Math Message 6.2 Silva has 17 CD’s. Mark has 8 CD’s. 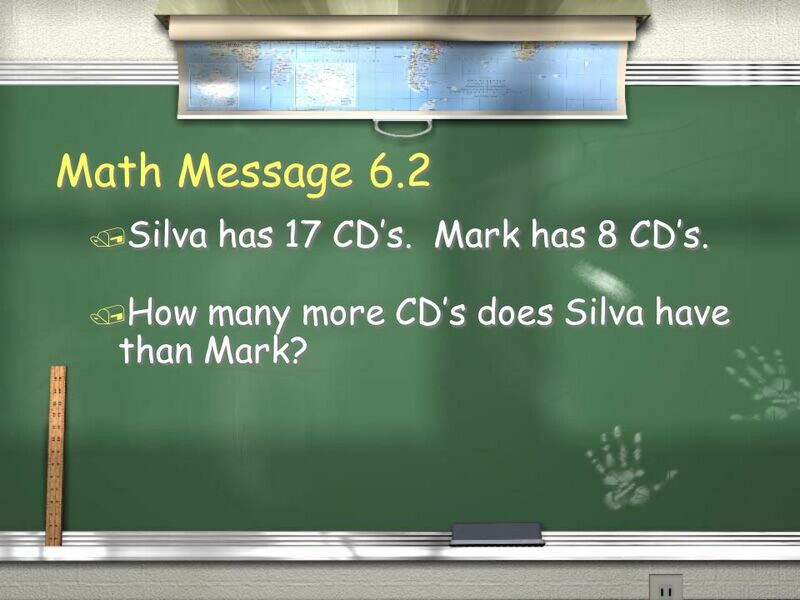 How many more CD’s does Silva have than Mark? 60 Math Message 6.4 Make a list of some things you like to collect. 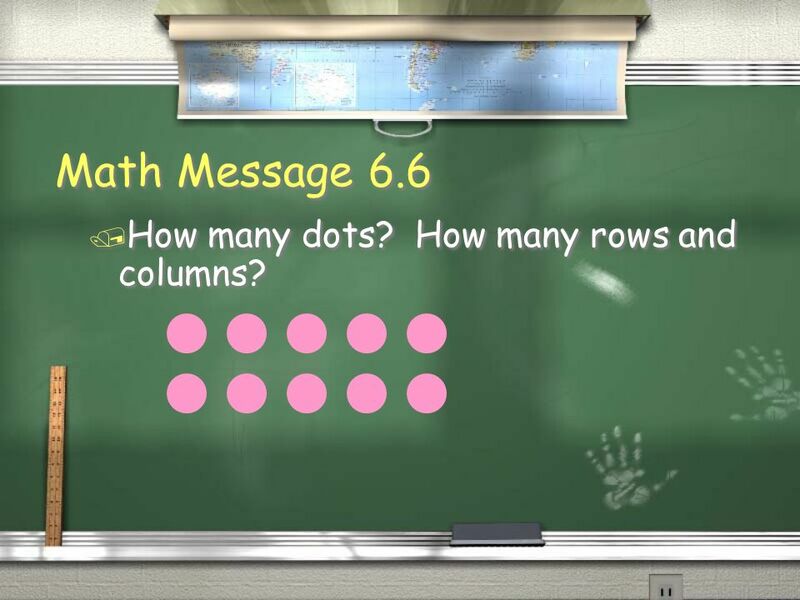 62 Math Message 6.6 How many dots? How many rows and columns? 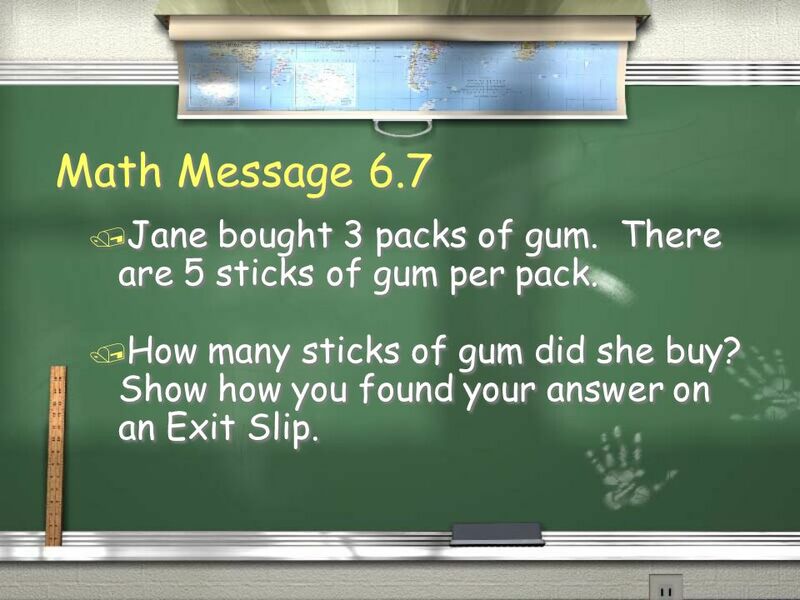 63 Math Message 6.7 Jane bought 3 packs of gum. There are 5 sticks of gum per pack. How many sticks of gum did she buy? Show how you found your answer on an Exit Slip. 64 Math Message 6.8 Egg carton: 2 rows of 6 eggs. Use a calculator to find how many eggs in all. 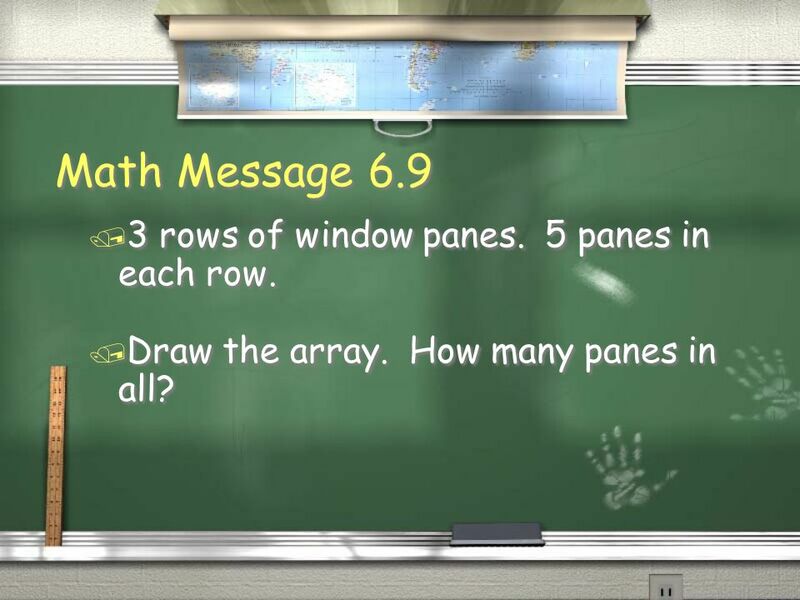 65 Math Message 6.9 3 rows of window panes. 5 panes in each row. Draw the array. How many panes in all? 66 Math Message 6.10 How would you use your calculator to solve this problem? 3 children share 12 pennies equally. 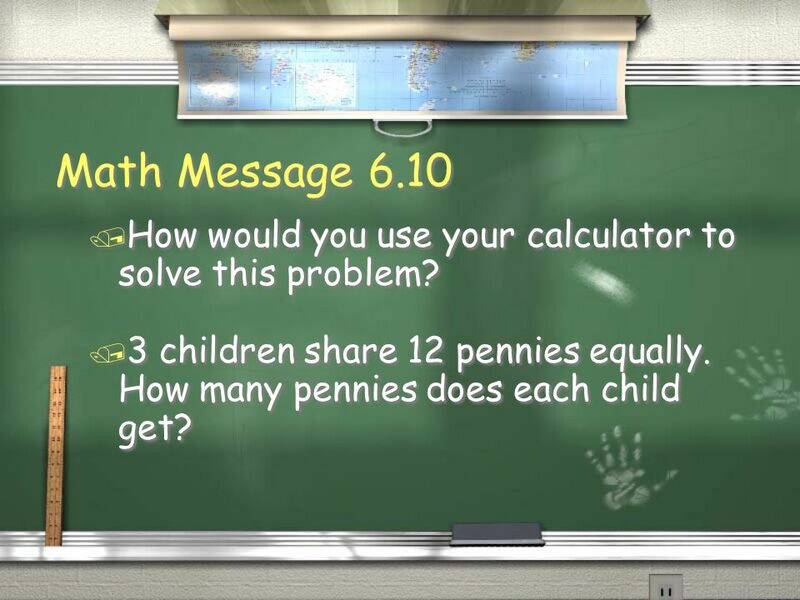 How many pennies does each child get? 67 Math Message 6.11 Complete the Self Assessment. Download ppt "2nd Grade Buffalo Trail Elementary"
Think about yesterdays weather. Do you think the temperature today is warmer than, cooler than, or about the same as the temperature yesterday? 2 nd Grade Math Review 2008 and 2009 SOL Released Test Items. Problem Solving with Money Making a Table Lesson 2 Chapter 6. 1 st Grade Math/CRCT Practice Look at the letters of the alphabet below. B E F A B C D E F G H I J K L M N O P Q R S T U V W X Y Z The 6 th letter of. Measurement What do you remember?. Year 5 Term 3 Unit 6b Day 1. Third Nine Weeks Math Review By Stacy Cruitt Sarah Housley Sarah Housley Amy Milam Amy Milam.